It was on this day in 1967 that two groundbreaking programs made their debut: Patrick McGoohan's The Prisoner and Gerry Anderson's Captain Scarlet and the Mysterons. If mystery/adventure of the early 1960s captured the youthful and optimistic energy of the jet-setters, these two programs marked a growing sense of consequences and uncertainty for agents of the space-age and Vietnam era. McGoohan's Danger Man had been on the air since September, 1960. His stories often exposed the darker side of espionage: moral sacrifices deemed necessary to protect the common good. His John Drake, though slightly insubordinate, presented the image of a man who could recognize -but look beyond- the distasteful consequences of his job in order to carry out his duties. His critique rose to a boiling point in a number of episodes (Yesterday's Enemies, To Our Best Friend) and ultimately became a foundation in his next project, The Prisoner (1967-1968). McGoohan's character in The Prisoner, now an unnamed spy, has resigned his job on a matter of principle. He has been kidnapped and placed in a remote village, where he undergoes constant psychological torture to determine why he resigned and whether he will spill his secrets. Capturing a later-1960s mistrust of authority, he never discovers if his torturers are the enemy after his secrets or his own people testing his loyalty (or indeed, his own mind). 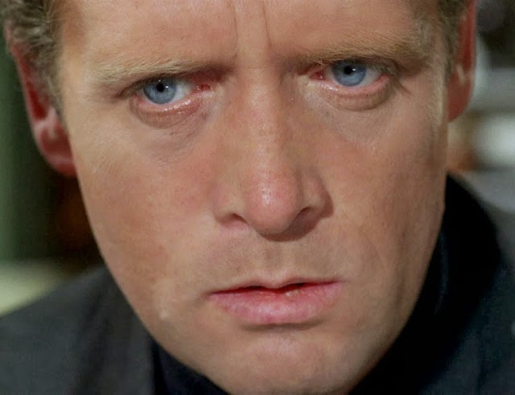 Known as Number 6 in the Village, McGoohan's character epitomized the theme of individual freedom, liberty, and rebellion against a surveillance state and conformity. There was a 2010 mini-series based on The Prisoner, starring Ian McKellen. Although it didn't quite measure up to the original, the show did a good job bringing the "Village" concept up to date in the form of complacent, consumeristic communities we see developing around trends in globalization. Gerry Anderson's Supermarionation programs, high-octane Sci-Spy adventures, had appealed to kids throughout the early 1960s. After establishing himself with inventive programs like Supercar, Fireball XL5, and Stingray, he found international success with Thunderbirds (1965-1966). The show had Anderson's familiar cocktail of futuristic gadgets and intrigue, and featured blockbuster stories that focused on a network of global rescuers determined to keep the world safe. But as he moved into the later part of the decade, Anderson, like others, moved toward darker themes of human nature and consequences, which echoed conversations around the Vietnam War and Cold War. Anderson's next project, Captain Scarlet and the Mysterons (1967-1968), began with a team of space explorers discovering a mysterious city of energy. In a single act of misunderstanding, the explorers mistake an innocent Mysteron gadget as a weapon and obliterate the city from the planet. As it turns out, the aliens can re-create any matter that has been destroyed. The city magically returns and the Mysterons vow to take revenge on humanity for its cruel, aggressive nature. The program was a much more violent affair. 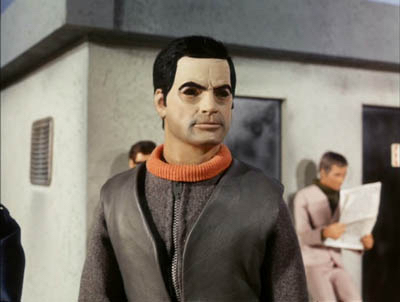 Even the hero, Captain Scarlet, began the series as an alien-constructed double agent assigned to assassinate the world's president. There was even a devastating suicide-bomber scene in the pilot. Once Scarlet was killed, however, he was able to regenerate and escape alien control. This established the arc of each episode, where the hero ultimately experiences a brutal death and resurrection. His colleague, Captain Black (below), remained a rogue killer-agent for the enemy. Children's programming? Dark times indeed! If these two programs illustrated transitions in the popular imagination, the trend seemed to take an odd turn by the following year. In a visit to the 1968 Exhibit in Oakland, I was struck by the odd juxtaposition of truly violent historical experiences in the news, public anxiety and protest, and the strange effort of (especially US) mainstream TV to create a lulling oasis with shows like Green Acres, Beverly Hillbillies, and I Dream of Jeanie. Filmmakers had more liberty to present subversive material, creating films like Easy Rider, The Monkees Head, and Night of the Living Dead. 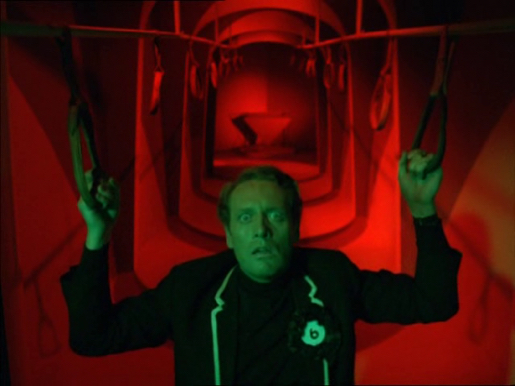 In the UK, The Prisoner and Captain Scarlet illustrated a culture trying to cope with the circumstances of the times within a mainstream medium. Whether it was questioning freedom and individuality, or consequences and culpability, these programs stand the test of time because they weren't afraid to ask questions and to frame them in ways that evoked excitement and real empathy. 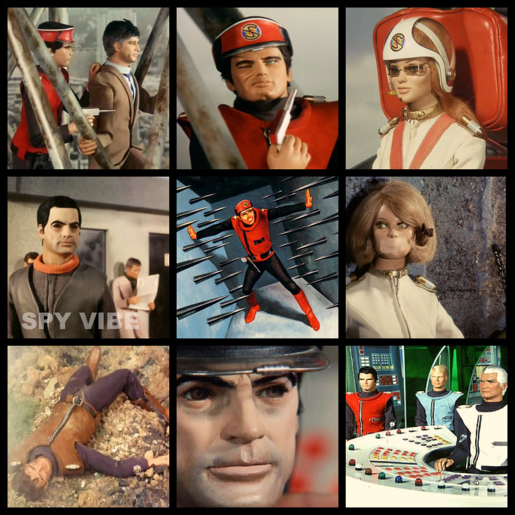 Spy Vibe wishes a very Happy 50th anniversary to The Prisoner and Captain Scarlet and the Mysterons. Related posts: Review: The Prisoner Vol 2 (Big Finish), Interview: The Prisoner Guide, Portmeirion Photography 1, Portmeirion Photography, The Prisoner London Flat, Alan Hayes Prisoner Audio Review, Interview: Ian Olgivy, Interview: Brian Gorman, Prisoner Supergrass, Prisoner XTC, Prisoner XTC 2, Prisoner DC Fontana, The Prisoner 50th Event, Gerry Anderson Comics, Inside Gerry Anderson, Anderson documentary, Thunderbirds Comic Collection, License to Kill Puppets, Anderson Models, Sylvia Anderson Fashion, The Prisoner and Captain Scarlet, Set Design Countdown #9, Nehru Jackets, Spy Vibe Radio #6 (The Prisoner). 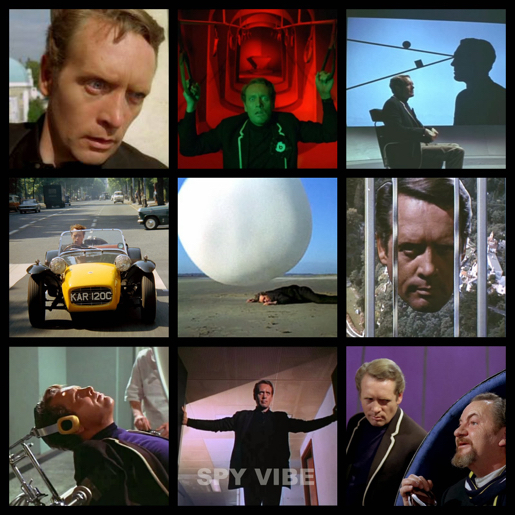 Selected Spy Vibe Posts: Hugh Hefner R.I.P., Jack Good R.I.P., Interview: Shaken Not Stirred, Callan 50th, Spy Vibe Radio 7, The Prisoner 50th Event, Spy-Fi Event, Kaho Aso 007, Two Million, Bo Diddley, Carnaby Pop, Le Carre Events, Billy Bragg Skiffle, Elvis 68, Jack Kirby The Prisoner, Casino Royale Concert, Review: The Prisoner Vol 2, Interview: The Prisoner Essential Guide, Maud Russell Mottisfont, Spy Vibe Radio 4, Batman Gallants, Adam West R.I.P., Village Triangle, Roger Moore R.I.P., Spy Vibe Radio 3, Sgt Pepper 50th, Satanik Kriminal OST, 60s Overdrive, Make Love in London, Spy Vibe Radio 2, Spy Vibe Radio 1, James Bond Strips, Propaganda Mabuse, Interview: Police Surgeon, XTC Avengers, 1966 Pep Spies, Batman Book Interview, Exclusive Fleming Interview, Avengers Comic Strips, Robert Vaughn RIP, UNCLE Fashions, Thunderbirds Are Pop!, Interview:Spy Film Guide, Lost Avengers Found, The Callan File, Mission Impossible 50th, Green Hornet 50th, Star Trek 50th, Portmeirion Photography 1, Filming the Prisoner, Gaiman McGinnins Project, Ian Fleming Grave, Revolver at 50, Karen Romanko Interview, Mod Tales 2, Umbrella Man: Patrick Macnee, New Beatles Film, The Curious Camera, Esterel Fashion 1966, Exclusive Ian Ogilvy Interview, 007 Tribute Covers, The Phantom Avon novels return, Ian Fleming Festival, Argoman Design, Sylvia Anderson R.I.P., Ken Adam R.I.P., George Martin R.I.P., The New Avengers Comics, Trina Robbins Interview, The Phantom at 80, 007 Manga, Avengerworld Book, Diana Rigg Auto Show, The Prisoner Audio Drama Review.